Archtober highlights the city's most compelling architecture and design in a series of tours, discussions, exhibitions, and films sponsored by a number of collaborating institutions. 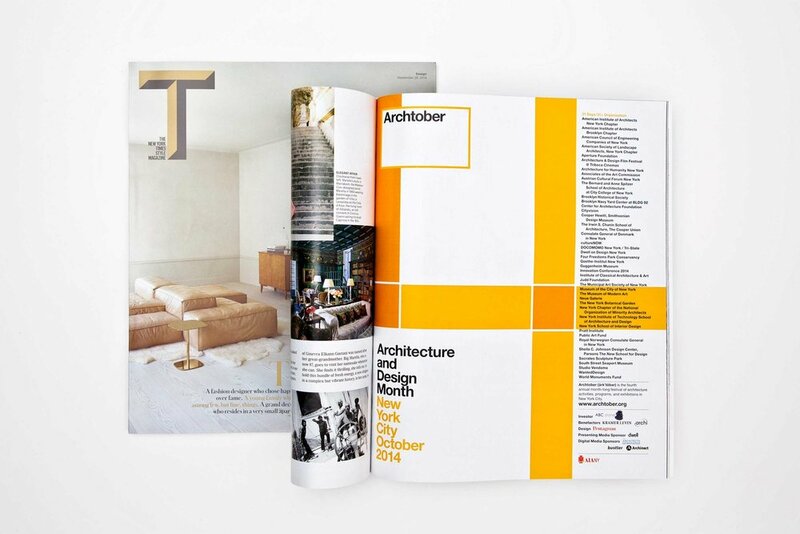 Pentagram has designed the identity and exhibition graphics for Archtober 2014, building on the designs the team has developed for the festival since 2011. In honor of the fourth year of the festival, the design features an abstract number 4, loosely inspired by the grid-based paintings of Piet Mondrian. The "4" design can be adjusted to fit a variety of applications, such as window decals, banners, and subway ads, as well as an animated version of the identity. The designers extended the concept of scalable graphics to the Archtober visitors lounge at the AIA'sCenter for Architecture in Greenwich Village, which serves as the home base for the festival and its activities. A large "4" frames the storefront window, inviting passersby to look inside the lounge. A yellow, door-sized panel leaning against the lounge wall displays the numerical date and a smaller leaning panel features one of Archtober's 31 Buildings of the Day. This project was made and produced at Pentagram, New York.